A remarkable recording launching collaboration between Evan Parker and September Winds, a group of four Swiss musicians playing wind instruments: Peter A. Schmid - bass & contrabass clarinet, contrabass saxophone (tubax), taragot; Hans Anliker - trombone; Jurg Solothurnmann - alto & soprano saxophones; Reto Senn - clarinet & bass clarinet, taragot. Evan Parker plays soprano and tenor saxophones, as well as a new instrument tubax developed by instrument builder Benedikt Eppelsheim. The recording is an incredible sonic adventure permiated with " profound sense of balance, the ferment and poise that both generate and sustain the music" (Stuart Broomer). Total time over 70 minutes. Notes by Stuart Broomer. The group September Winds was originally organized for a series of concerts in 2000. Planned to take place in an enormous empty water cistern above Zurich, the concerts were eventually cancelled due to fire regulations. Instead, the three-day meeting of Evan Parker and the Swiss wind quartet became the occasion for recording sessions in the cistern. The results were three full CDs of music on the Swiss Creative Works label. 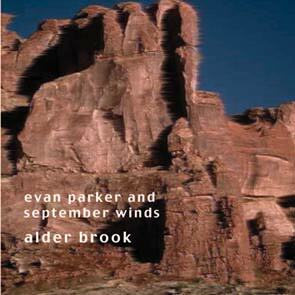 September Duos (Creative Works CW 1036) consisted of duets between Evan Parker and clarinetist Peter A. Schmid. A two-CD set, September Winds (CW 1038/1039), contained a CD of various permutations of the group and a staggering second CD of the full quintet engaged in an hour-long improvisation exploring the resonant capacities and quirks of the great hollow space. That music was an important moment, both in the continuum of Swiss music and in launching the collaboration between Parker and September Winds. Mountains breed resonance and a fascination with resonance, with vibration and echo. Long trumpets arise, whether the bass trumpet of Tibet or the Swiss alphorn. In Switzerland there's a special modern tradition of environmental and architectural music. Andres Bosshards Klangbr�cke Bern from 1990 (For 4 Ears CD 305) is one such work, a composition bridging interior and exterior space and incorporating the Aare River, a railway trellis, and a moving group of improvisers that included Butch Morris, Phil Wachsmann, and the Bauer brothers. Still more germane, in 1993 the late Werner L�di played and recorded his solo saxophones inside the great, hollow Lucendro dam (Unit Records UTR 4064 CD). So when Peter A. Schmid and September Winds undertook those performances in the cistern they were continuing an important tradition, one that was intimately connected with both psychological processes and the monumental architecture of industry. The choice of Evan Parker as participant could not be more apt, for he has come to embody the possibilities of resonance. He is the supreme explorer of saxophone sonics, combining "false" fingerings, overtone patterns and circular breathing until his solo soprano saxophone concerts approach a polyphonic complexity that suggests organ music. His knowledge of the internal terrain of the soprano has created a landscape as resonant as the Alps, while his recording situations have also revealed his keen sense of the resonance of a room. It's a highly useful key, as coherent as it is succinct. In placing the group in the framework of the ancient elements, it suggests its resonance as a mythic environment in itself, a complete framework of emotion and spirit in which each player contributes to the whole as he experiences it on his own individual terms. That elemental set is germane both to the way in which Evan Parker sees order and the way in which this group presents it, as a tuning with the elements as well as the reverberations among the horns. The music heard here is sometimes slow, often deeply reflective. Though its members number only five, the group plays orchestral music, and surely that's a result of the collective sense of completeness, of the indigenous form latent in its members different voices and visions. And you might take those four qualities engagement, poise, fluidity, scope as essential components in successful improvisation. This music is both metaphor and embodiment of community. Its remarkable how J�rg Solothurnmann's alto saxophone imparts a traditional jazz voice to this music, suggesting the essential quality of a Konitz or Desmond without ever imposing one-directional rhetorical strategies. Trombonist Hans Anliker plays the sole brass instrument in an ensemble of reeds and makes his every note count, sometimes anchoring and leading a continuous and extraordinary harmonic evolution in these pieces. The various clarinets of Reto Senn and Peter A. Schmid, the former often dryly calm, the latter bristling � both echo and balance one another, as well as making special compositional constructs. Each listener will find his or her own path through this music, but a few things repeatedly grabbed my attention. The alternating highs and lows in "Garanoir" constitute a remarkable play of breath, as if a single horn inhales high, exhales low, like a gargantuan harmonica. There's also the way the tubax and contrabass clarinet suggest the "Cinghiali," or wild boars of the forest. Note the balance achieved between Parker's extended soprano saxophone solo that begins "Z'blau wunder us, Jenins" and the chorale-like ensemble that eventually arises to embrace it. All of these suggest the profound sense of balance, the ferment and poise that both generate and sustain this music.